Transform leftovers into a tasty pork fried rice. 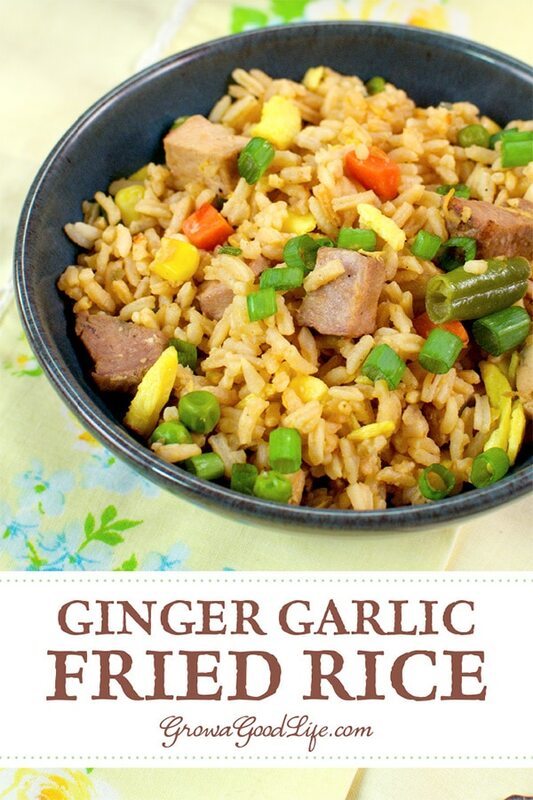 Combine pork, rice, and veggies with a ginger garlic sauce for a dish that will satisfy your craving for takeout. Fried rice is a great recipe to have on hand to re-purpose leftovers, so they don’t go to waste. This pork fried rice recipe combines leftover pork, rice, and vegetables with a tasty ginger garlic sauce for a dish that will satisfy your craving for takeout. 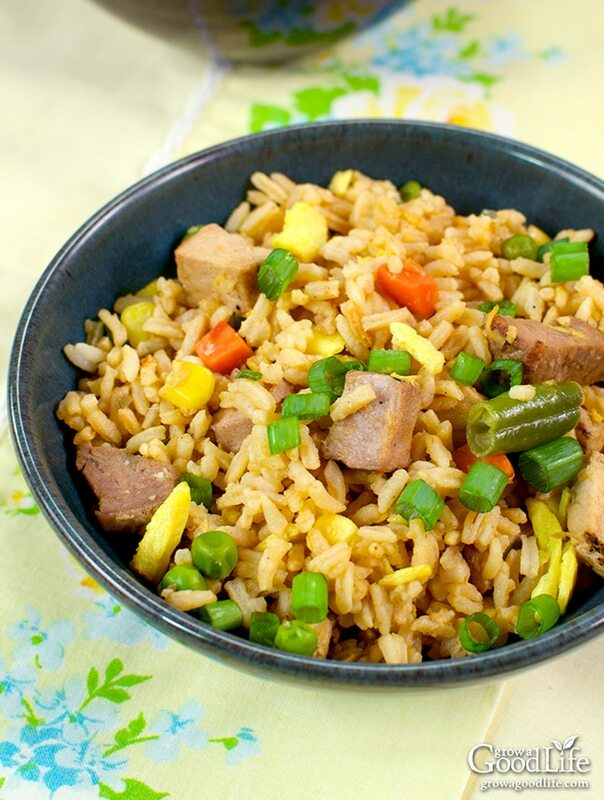 This pork fried rice recipe is very easy and adaptable. All you need is some cooked rice, leftover cooked meat, any type of vegetables you happen to have on hand, plus a few basic pantry items. Fried rice is almost never the same dish twice in this household because it is made with leftovers from the fridge or freezer. When I make rice, I usually make way more than we will need for one meal. If you need to make rice for this recipe, let the rice cool before adding so it stays fluffy. Even better, make the rice the day before and chill overnight in the refrigerator. This helps prevent the rice from sticking and getting too soft when making the fried rice. This is a basic recipe. 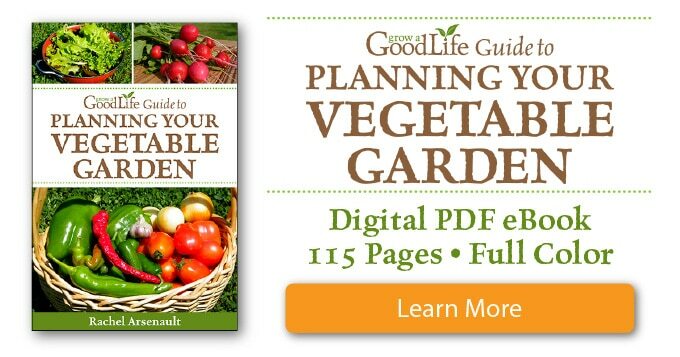 Feel free to use your favorite vegetables, pre-cooked, fresh or frozen. You can swap out the pork for chicken, beef, or shrimp. Or even skip the meat altogether and add more vegetables for a meatless version. 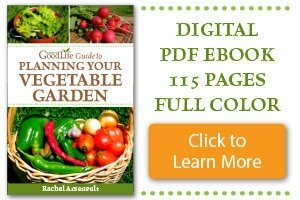 This is a fast and easy recipe that works well as a side dish or main meal. 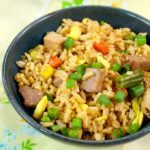 This pork fried rice recipe combines leftover pork, rice, and vegetables with a tasty ginger garlic sauce for a dish that will satisfy your craving for takeout. Preheat skillet or wok over medium heat. In a small bowl, combine the ginger, garlic, tomato sauce, soy sauce or tamari, chicken stock or water, and pepper. Set aside. In another small bowl, scramble eggs and pinch of sugar. Add about 1 tablespoon of olive oil to the preheated skillet or wok. Add the scrambled eggs to the pan, scramble, and cook until done, 2-3 minutes. Remove the eggs from the pan and set aside. Add 1 tablespoon of olive oil to the pan. Add the onion and garlic and stir-fry 1-2 minutes. Add the pork, vegetables, and ginger garlic sauce to the skillet and cook until heated through, about 2-3 minutes. Add the rice and mix to coat with the ginger garlic sauce. Add the cooked scrambled egg and reserved green onions. Mix to combine and keep warm until ready to serve. Makes 8 servings.